REALize your 4-Seat Adventures in the new Wolverine X4. 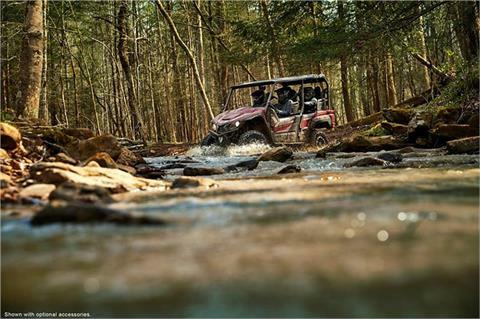 Proven Off-Road to take everyone and everything they might need anywhere. SMOOTH AND POWERFUL TWIN-CYLINDER ENGINE: The Wolverine X4 is powered by an 847 cc DOHC, eight-valve, parallel twin-cylinder motor that features the full range of Yamaha’s advanced performance technologies. Forged pistons and connecting rods ensure durable high-rpm performance, with Yamaha’s 270° Crossplane Concept Crankshaft for linear torque development and excellent power throughout the rpm range. To improve efficiency, the engine features a dry-sump design for a more compact layout and offset cylinder block to reduce friction loss, while rubber engine mounts and a geared counterbalancer ensures smooth running from idle to redline. ULTRAMATIC TRANSMISSION: Yamaha’s Ultramatic® transmission is the most advanced—and durable—CVT drive system available. An automatic centrifugal clutch maintains constant belt tension for reduced belt wear and a sprag clutch delivers natural all-wheel engine braking. In the Wolverine X4, a robust clutching system features an oversized belt for durability under aggressive riding, while still maintaining low cruising rpm for smooth, quiet running. 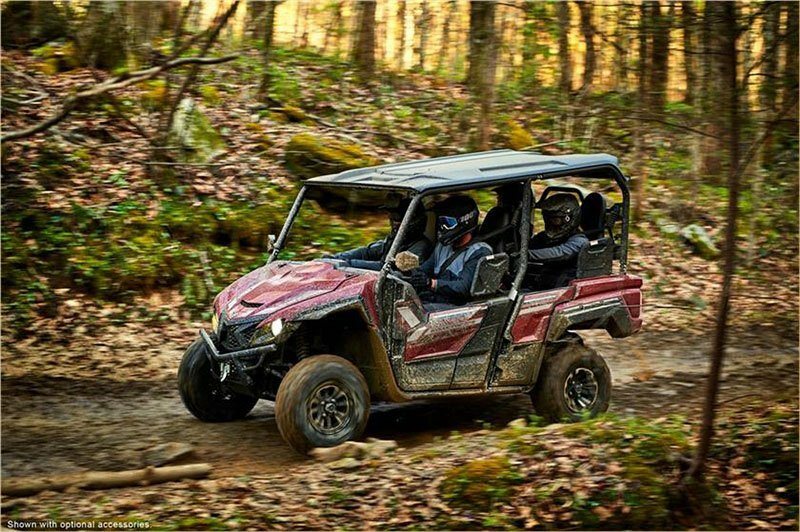 COMPACT AND NIMBLE CHASSIS: Designed for maneuverability, the Wolverine X4 chassis is super agile, making tight trails a breeze, with lightweight steering to select the ideal line when tackling obstacles. YAMAHA CHIP CONTROLLED THROTTLE (YCC-T): The Wolverine X4 engine utilizes YCC-T®, a drive-by-wire system that converts the driver’s commands into precise throttle control—Real World Tech for impeccable engine response. Throttle response is further improved thanks to a ‘high-response’ servo motor for ultra-fast throttle application, 12-hole fuel injectors and a high-volume airbox with two-stage air filtration. SELF-LEVELING SUSPENSION: The Wolverine X4 features self-leveling rear shocks that automatically adjust to changes in vehicle load. Not only does this system maintain ideal chassis geometry and eliminate the need to adjust shock preload, the system is completely self-contained and requires no heavy air compressors or electric motors. 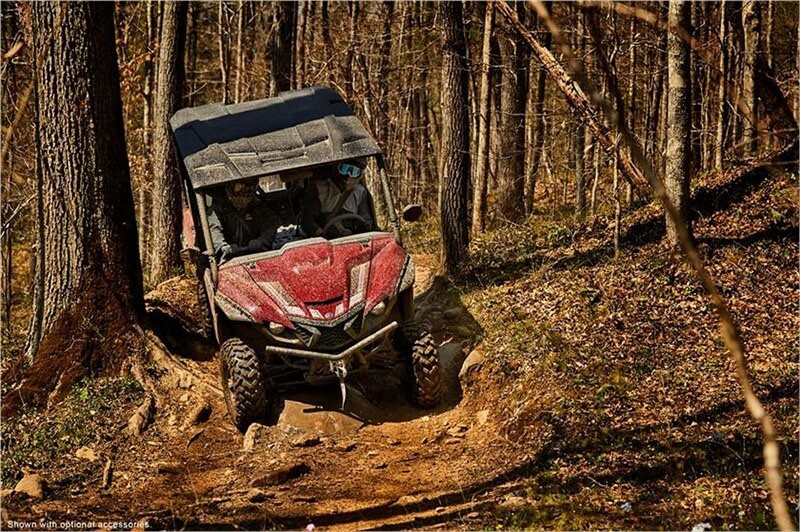 The motion of the vehicle itself pressurizes the shock’s internal valving, for an ideal chassis set-up on every ride. EXCELLENT GROUND CLEARANCE: Independent suspension at all four corners gives excellent response, handling feel and bump absorption. 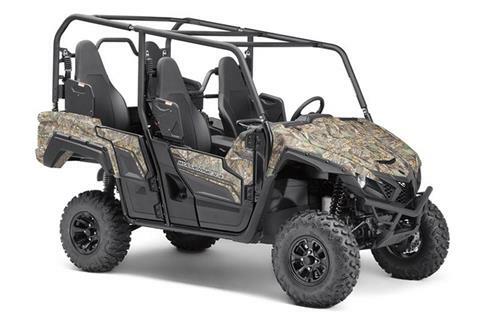 With an upswept underbody design and wide arc A-arms, the Wolverine X4 boasts big approach and departure angles to clear challenging terrain, with plenty of clearance to get in and out of the most remote areas. 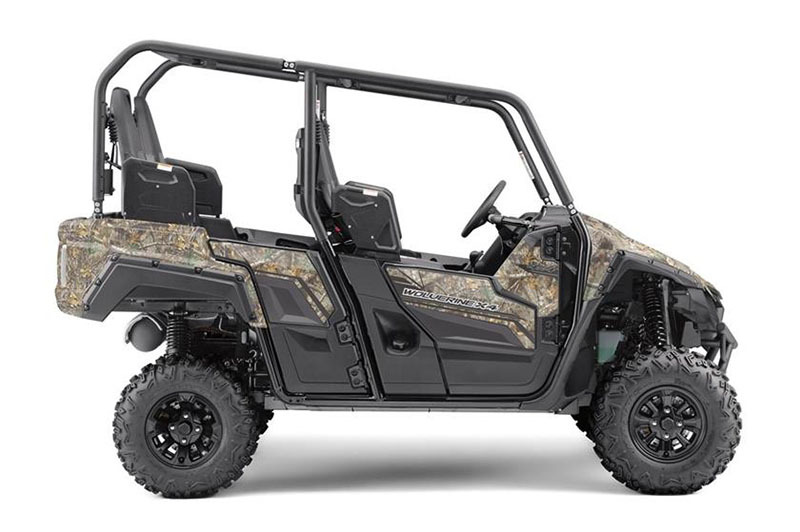 SMOOTH, QUIET POWERTRAIN: Thanks to spiral- and helical-cut drivetrain gearing, the rubber-mounted and counterbalanced engine, and a variety of noise- and vibration-reducing inserts around the cabin, the Wolverine X4 is one of the smoothest and quietest recreational side-by-sides ever built. Sneak through trails without disturbing nearby animals, or simply enjoy the improved refinement after a long day riding on the trail. ROOMY FOUR-PERSON CABIN: With four high-backed seats, each with shoulder bolsters and automotive-style three-point seat belts, the Wolverine X4 provides a comfortable perch for everyone on board, even with four adults. More importantly, the Wolverine X4 offers plenty of foot room, including in the rear seats, which are mounted slightly higher than the front row for stadium-style seating and enhanced visibility for all. Multiple cup holders, high-traction floorboards and adjustable driver seat and steering column round out the amenities. LED LIGHTING: The Wolverine X4 features LED headlights and taillights, for brilliant visibility, long life and minimal power draw. ACCESSORY READY: With nearly 600 watts of electrical output from the engine, two standard 12V DC ports and four pre-wired accessory switches, the Wolverine X4 is ready for a wide range of accessories and add-ons. INDUSTRY’S MOST DURABLE CVT: The Wolverine X4 transmission uses its own cooling intake to maintain proper temperatures, an oversized belt to handle the torque of the large motor, and Yamaha’s unique sprag clutch to maintain constant belt tension—the end result is a drivetrain built for years of trouble-free service that leaves the competition in the dust. 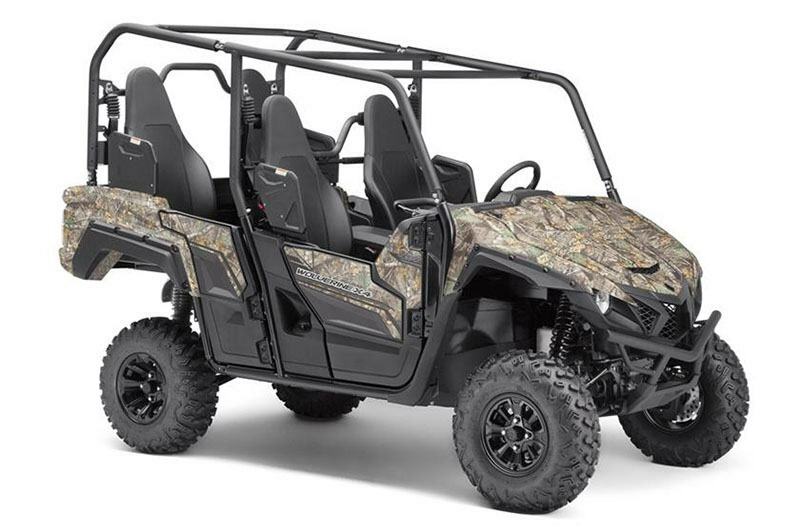 RELIABLE ENGINE LUBRICATION AND COOLING: With a large oil capacity circulating in the dry-sump system, liquid-cooled oil cooler, and a large radiator with integrated blower, the Wolverine X4 powerplant is able to handle the toughest jobs without complaint. 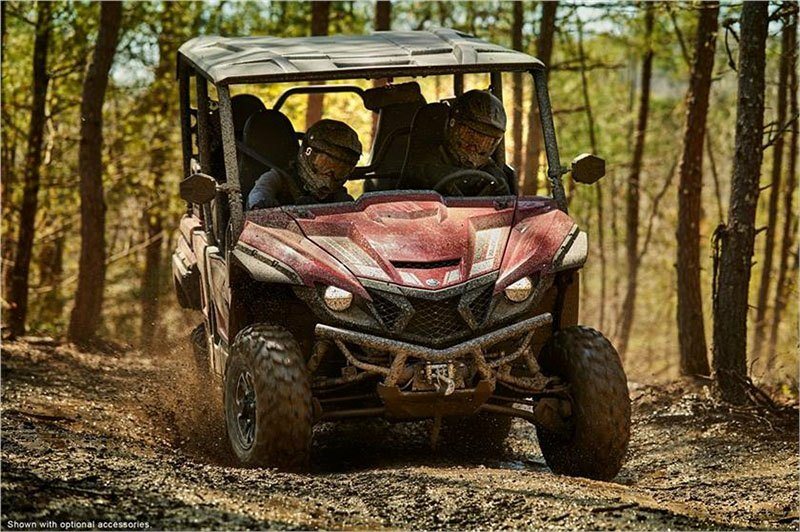 FULL UNDERBODY SKID PLATES: Complete skid plates protect the entire underbody of the Wolverine X4, from the front differential to the rear gear case, to ensure gnarly terrain doesn’t stop you. And as with other Yamaha machines, the skid plates include convenient service points to access fluid drain locations without removing the guards. SPEED MANAGEMENT SYSTEM: The Wolverine X4 also comes standard with a Speed Management System which allows the owner to limit the vehicle to a top speed of 25 mph, ideal for work sites or other special operating conditions. 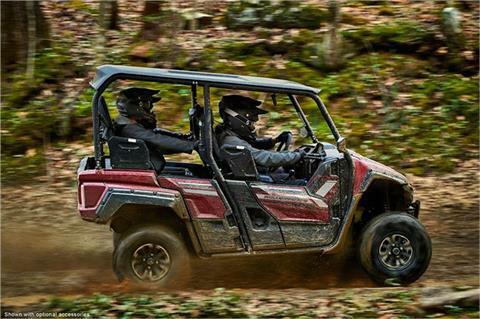 REAL WORLD TECH: Yamaha’s advantages in the side-by-side industry are easily seen in the technology that comes standard with every Wolverine X4™ - Yamaha’s driver-centric On-Command 4WD, ultra-reliable Ultramatic CVT and industry-leading, speed-sensitive Electric Power Steering. POTENT 847 CC TWIN-CYLINDER POWERPLANT: Featuring drive-by-wire throttle, a 270-degree crankshaft design and lightweight internals, the Wolverine X4 shares technology with Yamaha’s class-leading sportbikes, for thrilling performance on every ride with unmatched smoothness and refinement. ROOM FOR FOUR: With high-back seats and plenty of legroom, the Wolverine X4 offers comfortable, secure seating for four full-sized adults. The second row is raised for excellent visibility, with comfortable handholds and three-point seatbelts for each seat. 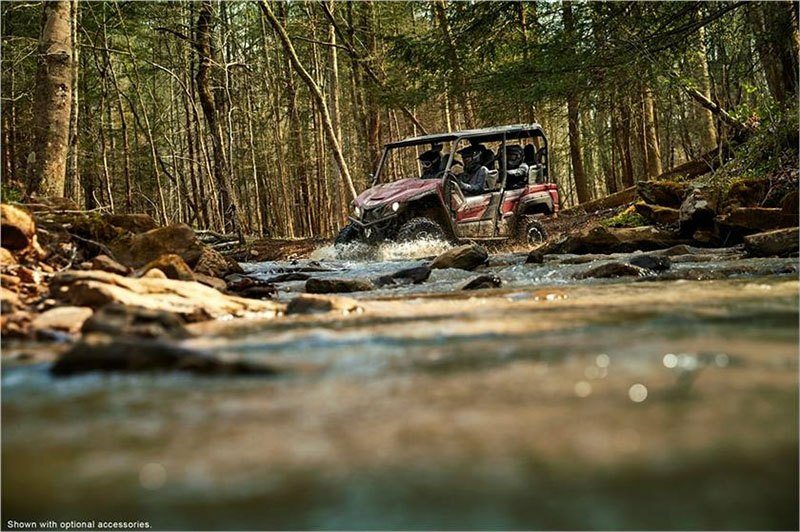 VERSATILITY UNEQUALED: The Wolverine X4 offers a balance of work-ready functionality, refined comfort and trail-proven capability that confirming Yamaha is the ultimate outdoor adventure partner.